ComEd employees volunteered more than 28,000 hours in 2017. 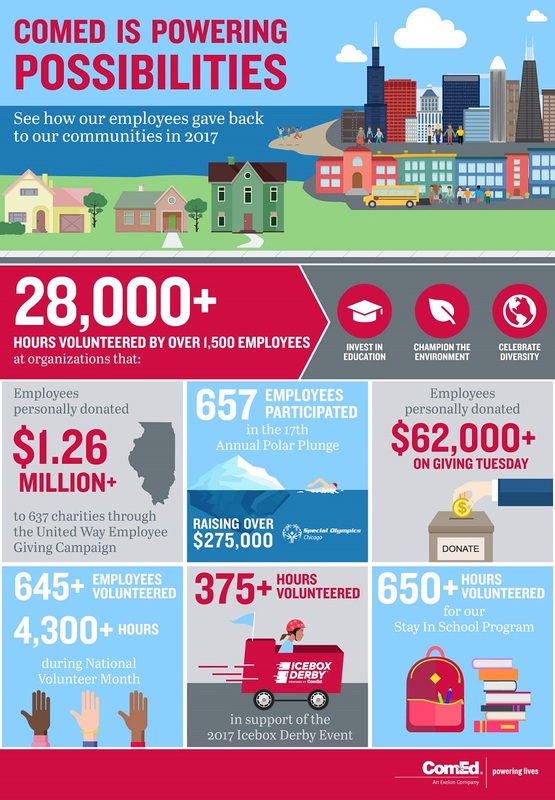 In 2017, ComEd employees took the tagline of “Powering Lives” and turned it into a reality by volunteering more than 28,000 hours and donating $1.26 million through the Employee Giving Campaign for worthy causes that impact the health, safety and quality of life for millions of people in our communities. From jumping in Lake Michigan for the annual Polar Plunge to benefit Special Olympics Chicago to walking in the annual Alzheimer’s Association Walk to End Alzheimer’s, ComEd employees stay busy all year long. Exelon, ComEd’s parent company, announced that the company achieved a new record in corporate philanthropy and volunteerism in 2017, volunteering 200,000 hours and committing $46.5 million to charity. Learn more about how ComEd powers lives across Illinois at ComEd.com/Community.